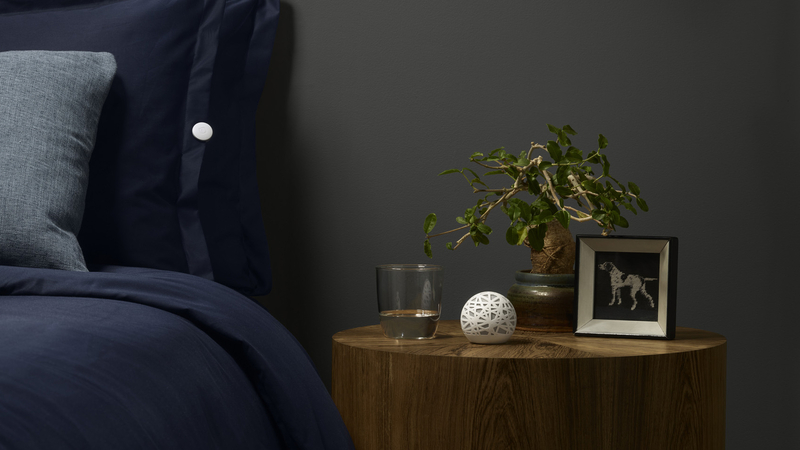 Company Hello is back with an update to its sleep tracking orb, Sense, which debuted in 2014 following an impressively successful Kickstarter campaign. The new device is called Sense with Voice, which hints pretty well at what's new here. The added control features allow you to set alarms, hit the snooze button, or find out how well you slept by using voice commands, the idea being to not only make controlling Sense a little easier, but to stop you using your phone so much during sleep hours. While the original Sense tracks air quality, light, noise pollution, luminosity and humidity, the new device now also keeps an eye on carbon dioxide levels, UV light, volatile organic compounds, barometric pressure and light temperature. With all of this data combined, you should get a pretty good idea of what is affecting your quality of sleep, so as to improve it. Like the first device there's still a small button, separate to the orb, that attaches to your pillow while you sleep. Hello has also made Sense better at integrating with the smart home, and now works with Nest and Philips Hue so you can set your perfect waking-up temperature or lighting. We were disappointed in our original Sense review, particularly by the quality of the sleep tracking and coaching, so we're hoping to see some big improvements with the new one. The new Sense with Voice costs $149 (UK price incoming, hold tight) and can be pre-ordered from Hello's site right now. The site currently says that orders will ship within three to four weeks.